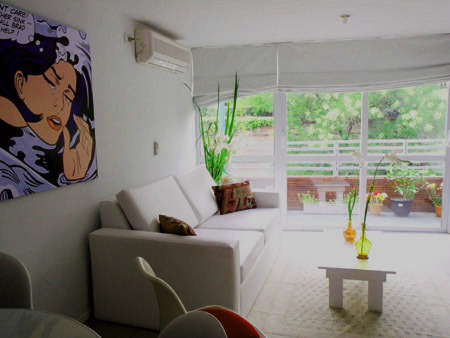 Divine duplex in two levels located in the heart of Palermo Soho. On the first level there is a spacious living-dinning room with a modern design and an open plan kitchen, guest toilette and a balcony. On the second level you will find the bedroom with king size bed and ample storage space and en-suite bathroom. On the third level a 30sqm of terrace with BBQ, reclining chairs and shower. This home away from home will make you stay in Buenos Aires memorable and comfortable. Balcony, terrace, large windows, cable TV, 2 AC hot and cold, Wi Fi.- Kitchen fully equipped. Maid service once per week. Very good building with a perfect location.